We were really delighted when the Australian Government brought together communications and the arts to form your Department. On paper, the Department of Communications and the Arts seemed to be the perfect home for the video game development industry. We, like Screen Australia, aim to engage audiences and support a creative, innovative and commercially sustainable industry. However, we’re specifically excluded from qualifying for government funding. If only the video games industry was more creative, innovative and commercially viable… oh wait it is – see chapter 2, point 2.13 of the Senate report into the future of Australia’s video game development industry. In fact, time and time again, we’re left out of the screen conversation. Earlier this month, you announced an Australian content review. While we will remain positive, we doubt there will be anything about games. Just last week ACMA, in conjunction with your Department, held a conference on the Australian content conversation. You delivered the keynote. Again, there was nothing about games. Our hopes were up on 29 April 2016, when the Senate Standing Committee on Environment and Communications presented its report on the future of Australia’s video game development industry and followed with eight recommendations for the government to help the sector to reach its potential. We thought we’d finally received the recognition from government that we needed and deserved. It’s been 390 days since the Senate Standing Committee handed down its report, and you are yet to respond. Minister, how did we get here? In your keynote to the Australian content conversation conference, you spoke about audiences turning away from traditional, linear content models, and children growing up with Australian content. Why is it then that games don’t seem to earn the credibility that film and TV receives? We know that 68 per cent of Australians play video games. Ninety-eight per cent of homes with children under the age of 18 have computer games. We don’t want to take away from the screen industry. Rather, we’ve got a lot of value to bring, but we need to be at the table. 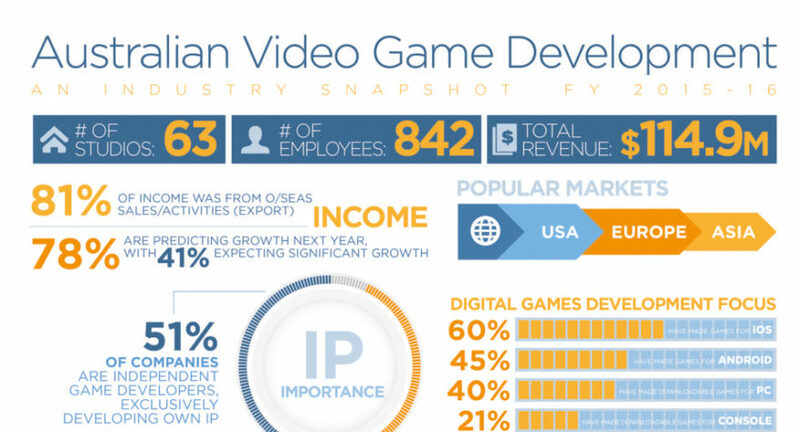 The Australian video game development industry has huge potential as a weightless and clean export. It’s an intensively creative industry but also highly innovative and technical, and usually at the cutting edge of technology. In addition, games have the capacity to solve high value problems. Australia has the potential to take an international lead in the emerging industry of serious games – games intended for non-entertainment purposes. These are games that are used to assist in dementia care, games that enable stroke patients to engage in rehabilitation exercises, games designed to promote road safety or deliver positive mental health outcomes for our youth. New technologies, such as virtual and augmented reality, will only increase the potential applications for serious games. Video games can also be harnessed for learning, particularly when it comes to getting Australian youth interested in STEM fields. Just look at the success of coding clubs, where children use and develop these skills in learning how to create their own games. Across other departments, the government has a proven model for assisting sectors like ours. For example, it has identified six industry sectors “of competitive strength and strategic priority” and has invested in building Australian companies’ expertise in these areas through the Department of Industry, Innovation and Science’s industry growth centres. Take cyber security. This is one area in which the government believes Australia can be a global industry leader. To that end, it set up the Australian Cyber Security Growth Network, which has now been operational for 12 months and has been getting real traction. Just last month, the government launched the Cyber Security Sector Competitiveness Plan, which provides a roadmap to strengthen Australia’s cyber capabilities. Each of the six industry sectors has a champion in government. Cyber has two – the Minister for Industry, Innovation and Science, Arthur Sinodinos, and the Minister Assisting the Prime Minister for Cyber Security, Dan Tehan. We don’t have a champion. In fact, we’re not even on the radar. We know that Australians love high quality, locally-produced content, and are consuming it in more ways than ever before. We know that Australia has a strong appetite for innovation and developing new sectors. To that end, supporting the Australian video games industry should be a no brainer. We thought Communications and the Arts was a natural fit, but if we’re not going to get a mention, do we need to move to get attention? Is the Department of Industry, Innovation and Science, or perhaps the Department of Trade, Tourism and Investment, a better fit for us? We’d like to stay and play, but we’ve got serious business to do.